One of the many things I enjoy about Caltech is walking among the lovely olive trees lining the walkways that meander throughout the campus. They provide the perfect canopy during the often hot and steamy summer days that are part of the Pasadena climate. As beautiful as the olive trees are, they also have a more practical use, the olives! Instead of letting the olives drop off the trees and get smashed on the sidewalks, campus officials decided to host a volunteer Olive Harvest Festival in the fall. Anyone can participate and it is great fun for the entire family. The first festival in 2007, attracted over 350 volunteers who managed to pick 1,460 pounds of olives from 130 olive trees around campus. 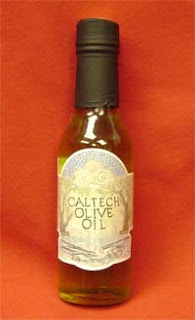 The olives are then processed by an outside vendor, and bottled to yield Caltech’s own special Olive Oil which is sold at the campus bookstore. Recently Zoe, the culinary maven that she is, came up with her own special creation called “Caltech Crostini,” the nucleus of which is Caltech olive oil. It is a superb appetizer/hors d'oeuvres. She prepared her creation during a recent family visit to the East Coast. Zoe agreed to make her special recipe available to all you Science Lifestylers. Let us know how it comes out when you try the recipe! There are 3 parts - The Crostini, goat cheese, and topping. Blend the Caltech olive oil 2/3 with 1/3 Whole Foods 365 Extra Virgin. You can buy Crostini but homemade is much better. Just cut a baguette into 1/3 inch slices and brush with Caltech olive oil blend. Toast for 5 minutes per side at 400 degrees. Watch carefully as not to burn. Cool on cooling rack. They should be crusty outside, slightly chewy inside. Top each Crostini with about a 1/4 inch slice/spread of goat cheese and spoon the topping over this. The topping is a mixture of roasted red peppers, whole roasted garlic cloves, chopped fresh basil, and capers in the Caltech olive oil blend. Roasted Red Peppers: you can shortcut and buy these in a jar, but you might prefer to prepare from scratch. Just sear red (or yellow) bell peppers all around over a fire until the skin blackens and blisters. Put the peppers in a brown bag for maybe 15 minutes. It will then be easy to peel the skin off. Chop roughly (1/3" by 1" julienne is nice). Roasted Garlic: slice 1/3" off the top of any several whole heads of garlic. Peel off the extraneous papery skin from all, leaving only the skin around each clove, and leaving the head intact. Put in a small baking dish, and thoroughly douse with the Caltech olive oil blend, rubbing it everywhere. Sprinkle with salt and pepper. Roast at 375 for 35-40 minutes if the cloves are smaller, 50 minutes if larger. Let cool. Roughly chop fresh basil. Thoroughly rinse capers so they are not too tart/vinegary. Mix the roasted garlic cloves, roasted peppers, basil and capers in a bowl - heavy on the roasted garlic, very light on the capers. Pour in the Caltech olive oil so that it resembles a soup. Spoon this over the goat cheese on the Crostini. The idea is to have about a 1/2 tbs of peppers, a couple of cloves of garlic, 1 tsp+ of basil, several capers, and a generous dose of olive oil on each. If the hors d'oeuvres are to be hand passed, they can be assembled and served. If they are to be served at an appetizer table, it's best to present deconstructed so they don't get soggy. Just put the Crostini on/in a platter/bowl. Pre-slice the goat cheese and plate, or smooth/fluff and serve in a bowl with a spreading knife. Put the topping in a bowl with a spoon. You could also further deconstruct for an appetizer table by not pre-mixing the topping. Just put each of the topping ingredients - garlic cloves, capers, fresh basil, roasted peppers in their own little bowls with little spoons, alongside the goat cheese and Crostini platters. In this way, the Caltech olive oil jar can become part of the presentation. As a nice touch straight out of the lab notebook for any scientists in attendance, prepare a little placard at the hors d'oeuvres table, with a title, listing ingredients, and how to eat if necessary. THIS recipe is awesome! Thnax. Gail from Durham.